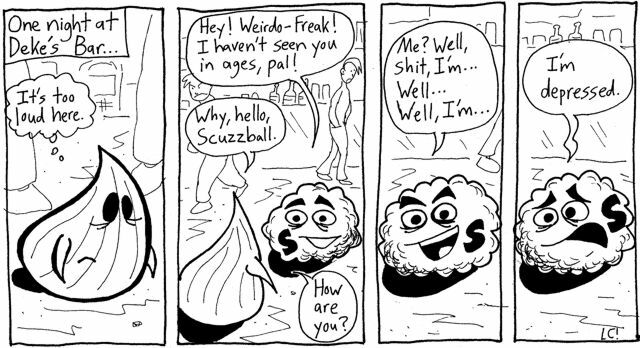 Welcome to a bold new era of Fuzzball & Scuzzball. Though, to be honest, the bold new era is from 2002.
a. Approach it more like a comic strip and less like a comic book. b. Change the lettering to include lower case letters. Most comics lettering is in all caps, but mine looks better when it's not all caps, and I finally realized this. c. Try to make it funnier, but at the same time, darker and more character-based. So, for instance, this is just the beginning of a longer storyline about Scuzzball's depression. So it's dark, yet hi-jinx still ensue. And, since it's paced more like a comic strip than a comic book, there are strips coming up that have nothing to do with his depression. d. Introduce Fuzzball & Scuzzball's supporting cast. Like Weirdo-Freak. This has gotten long, so more on him next time.